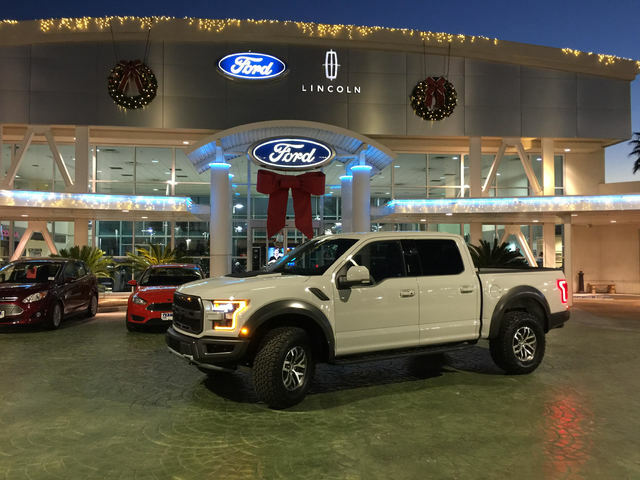 Christmas came twice this year for Team Ford Lincoln customer Ric Jones — once on the 25th and then again on the 28th, when Jones received a phone call from Chris Goeschel, general manager of Team Ford Lincoln. COURTESY Ric Jones bought a Ford Performance 2017 Raptor from Team Ford Lincoln. The new Raptor is part truck, part rocket. The all-new, twin-turbo, intercooled DOHC 24-valve, high-output 3.5L EcoBoost with direct fuel injection will deliver more power than the previous generation Raptor. The 2017 Raptor produces 450 horsepower and 510 pound-feet of torque. A 10-speed automatic transmission with manual-shifting mode sends that power to all four wheels. And the all-new Terrain Management System allows the driver to select from six preset modes to optimize driving dynamics to environmental conditions. Available settings include street, Baja, mud and sand. It features better running clearance than the first-generation Raptor. Additionally, to manage the power distribution between the front and rear wheels, Ford has added an all-new, four-wheel-drive, Torque-on-Demand transfer case. It combines the best attributes of clutch-driven, on-demand all-wheel drive with durable, mechanical-locking four-wheel drive. The 2017 Raptor also sports 3.0-inch Fox Racing Shox with custom internal bypass technology. This technology allows for variable damping rates based on wheel travel, which provides great off-road performance and a smooth ride on-road. A high-strength, military-grade aluminum alloy makes the all-new Raptor approximately 500 pounds lighter than before. Combine that with its unique high-strength, boxed steel frame, and this is the best-performing, most capable Raptor yet. Team Ford Lincoln, located at U.S. Highway 95 and Ann Road, features sales, service and parts with an incredible selection of new vehicles, an on-site cafe with fresh-brewed Starbucks coffee and made-to-order food and snacks and a lounge with Wi-Fi.